Download "The Bayt.com Middle East and North Africa. Salary Survey 2016. May 2016"
2 Objective This research was conducted to gauge employee satisfaction levels with their salaries, but also pay raises and factors impacting their satisfaction, across countries, career levels, jobs roles and industries in the Middle East and North Africa (MENA) region. The study s key objectives are as follows: Understand employee satisfaction levels with current salaries. Explore pay increases received in the past year and satisfaction with these. Assess pay increases expected in the coming year. Explore factors impacting pay increases/ decreases in each country. Assess drivers of loyalty towards current employer. 7 Summary Almost all respondents (96%) work full time, across a wide variety of career levels, job roles and industries. Across the region, more than half (53%) have been working in their current career path for 6 years or less. A similar proportion (50%) have been with their current employer for 3 years or less, while a small number (7%) have been with their current employer for at least 11 years. Half of respondents (51%) have 10 people or less reporting to them (both directly and indirectly). Almost 8 in 10 (79%) respondents surveyed across the region hold mid to senior level positions. The largest proportion (71%) surveyed have held 1 or 2 jobs over the last 5 years. On average, 41% of respondents held a job for 2 to 3 years. 1 in every 5 respondents claim to have stayed in a job for at least 6 years. 16 Summary Across the region, the largest proportion of respondents (56%) claimed their current salary package consists of basic salary plus benefits. 30% claimed to receive basic salary only. 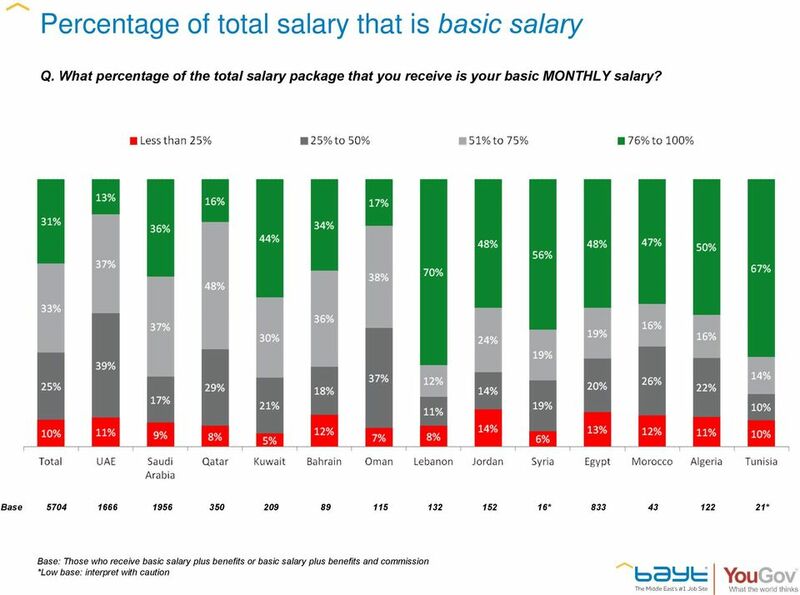 Most respondents working in Algeria, Jordan, Morocco, Syria and Tunisia are only entitled to their basic salaries (55%, 58%, 67%, 50% and 65%, respectively). Across the region, only a very small proportion (4%) claimed to have high levels of satisfaction with their current salary. Westerners appear to have the lowest levels of dissatisfaction with their salary, with a third (33%) rating their satisfaction as Low. Approximately, 1 out of every 2 employees (53%) receive personal medical insurance from their company. Additional benefits received by employees differ across countries. Specifically: Personal medical insurance is provided to 64% of employees in Saudi Arabia, a proportion that is much higher than in any other country covered. A greater proportion of employees in Oman, Qatar and the UAE (28%, 28% and 28% respectively) receive gratuity benefits, compared to all the other countries (14% overall). A higher proportion of those currently employed in the Gulf region (Bahrain: 23%, Kuwait: 23%, Oman: 40%, Saudi Arabia: 43%, UAE: 48%) receive personal annual air ticket. More respondents from Lebanon and Saudi Arabia receive transportation allowance (48% and 39%, respectively). Housing allowance is provided to a higher number of respondents in Saudi Arabia, Qatar, and the UAE (45%, 36% and 30% respectively). Bonuses emerged as the additional benefit most favored by respondents across the region (selected by 62%). 23 Summary The largest proportion (42%) of those surveyed did not receive a pay increase in 2015, with respondents from Morocco (56%) and Algeria (57%) most likely to make this claim. Of those who did receive an increase, the greatest proportion received was between 1% and 5% (according to 28% of respondents). More than half (54%) of those who received a raise in 2015 are unhappy with their raise. Residents in Egypt, Jordan, Morocco and Oman were the most unhappy (60%, 67%, 61% and 61% respectively). Just under a third of respondents (31%) do not expect to be given a raise in 2016, with employees in Morocco (50%) and Algeria (49%) being most pessimistic. While half (50%) claim they cannot comment on the issue, almost 3 in 10 (28%) believe there is parity in the salaries given to men and women in the same position and doing the same work in their company. 30 Summary Across the region, two-thirds of those surveyed claimed to have seen an increase in rents, food and utilities in 2015 (68%, 67% and 65%, respectively). Those in the UAE and Kuwait were most likely to have experienced an increase in rents (at 80% and 82%, respectively), while those in Egypt were most likely to report an increase in food and utilities (83% and 85%, respectively). When probed on their savings, over one-third (35%) of respondents across the region claim they do not manage to save any of their monthly salary. Those in Jordan, Morocco and Egypt were most likely to be unable to save money (57%, 56% and 49%, respectively). Almost 4 in 10 (39%) of those surveyed across the region repatriate a proportion of their savings to their home countries, with those in expat-rich GCC region being much more likely to repatriate part of their savings. When asked which three industries provide the best salaries in their country of residence, Oil, Gas & Petrochemicals, Banking/ Finance and Airline/ Aviation topped the list of the highest paying industries. When asked about their preferred paid structure, two-thirds (63%) of those surveyed across the region said they prefer a 100% fixed pay. Those in Bahrain and Qatar were most likely to prefer a fixed pay structure (74% and 71%, respectively). The majority (63%) believe their salary is lower than other companies in their industry. 38 Summary When asked about their plans in the next 12 months, more than half (53%) of those surveyed plan to look for a better job in the same industry, while a considerable proportion are willing to go even further to improve their circumstances, by either looking for a better job in a different industry or by looking for a better job elsewhere in the Middle East (31% and 25%, respectively). Those in the UAE were the least likely to look elsewhere in the Middle East (12%), while those in Algeria, Tunisia and Oman were most likely to follow this plan (51%, 46% and 41%, respectively). Almost half of those surveyed (48%) expect salaries to increase in the next few months. 1 in every 4 (23%) expect salaries to stay the same, while 20% expect salaries to decrease. Those in Lebanon and Jordan were most likely to expect salaries to stay the same (36% and 35%, respectively). Among those who think salaries will increase, the majority (63%) believe these will be mostly driven up by inflation/ rise in the cost of living, followed by growth in opportunities and economic growth in their country of residence (30%). UAE residents were the most likely to believe salaries will be driven up by growth in opportunities (41%), while those in Lebanon and Jordan were most likely to expect salary increases would be driven up by inflation/ increased cost of living (77% and 74%, respectively). Over half (56%) of those who believe salaries will either decrease or stay the same, attribute this to poor economy or declining oil prices. This sentiment was most accentuated in Oman, Algeria, Qatar and Lebanon (72%, 70% and 65%). 44 Summary While almost half (48%) of those surveyed across the region said loyalty to their company is linked to the salary they receive at least to some extent, a considerable proportion (35%) claimed their loyalty in not linked to the salary they receive. Those in Tunisia, Morocco and Egypt were the most likely to claim their loyalty is not linked to the salary they receive (53%, 45% and 45%, respectively), while those in Saudi Arabia were most likely to claim their loyalty is directly linked to their salary (53%). 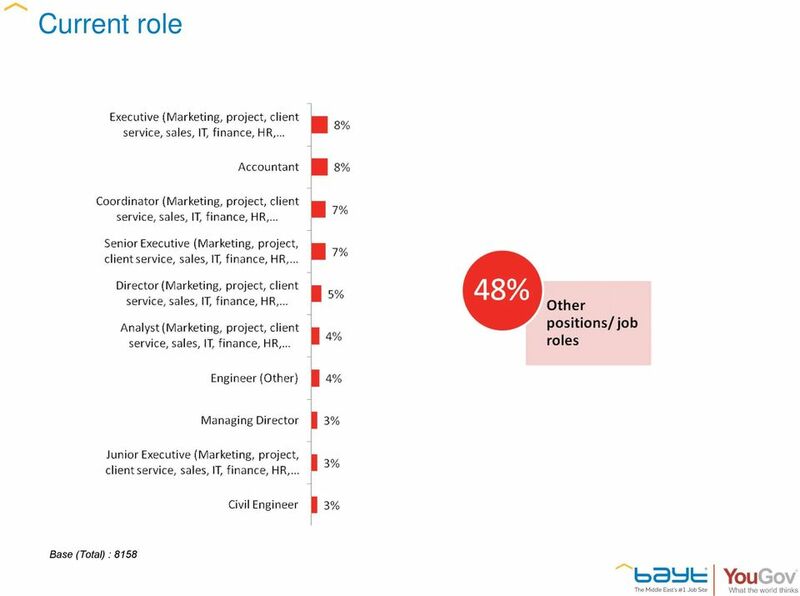 Besides salary, one s line manager (38%), opportunities for long-term career advancement (35%), and senior management (27%) all emerged as important drivers of employee loyalty. Line managers are considered a stronger driver of loyalty in Jordan (45%) and Saudi Arabia (44%), while opportunities for career advancement are a stronger driver of loyalty in Bahrain (42%), Oman (42%), Kuwait (39%) and the UAE (40%). 48 Summary Almost 6 in 10 (58%) of those surveyed across the region stated their company offers end-ofservice benefits. This benefit was most often claimed in Qatar (80%), UAE (77%), Kuwait (67%), Saudi Arabia (67%) and Oman (63%). On the other hand, pension on retirement is higher in Algeria (54%), Morocco (31%), Tunisia (31%), Jordan (21%) and Lebanon (21%). Two-thirds (64%) of those surveyed across the region claim their company does not pay for overtime. Those in the UAE (74%), Lebanon (73%) and Bahrain were most likely to make this claim. Meanwhile, almost half of respondents (47%) claim their company does not provide a bonus or incentive plan. Those in Morocco, Jordan and Algeria were most likely to make this claim (54%, 51%, 51%, respectively), while those in Oman, Kuwait and the UAE were most likely to work for companies with bonuses or incentive schemes (46%, 44% and 43%, respectively). Of the 38% whose companies do provide a bonus or incentive plan, the majority of them (66%) receive an annual or year-end bonus. The largest proportion (29%) claimed their company reviews its salary structure every year, while 1 in every 4 claimed their company never does so. 38% of those surveyed across the region claimed they had never received a salary adjustment; 42% had their salary adjusted in the last 1 year or more recently. 21% had been promoted in 2015, with 60% of them claiming this was associated with a pay increase. Those in Egypt, Qatar and Saudi Arabia were the most likely to claim their promotion was not accompanied by a pay increase (45%, 44% and 43%, respectively). 58 Summary Only 14% of those surveyed across the region claimed to make regular (monthly) financial investments. This proportion is higher amongst Westerners (21%) and Asians (21%), compared to the Arab nationality groups. Generally speaking, 15% across the region had invested in local property, with another 11% investing in their own business and 9% in gold. In terms of expenses, rent is by far the top monthly expense at 46%, and it is particularly high for respondents in UAE (65%), Kuwait (56%), Qatar (53%), and Bahrain (52%). Across the region, home ownership is at 33%, with the highest percentage of people who own a home being in Egypt (54%), and lowest in Morocco (14%). Of the respondents who do not own a home, the majority (60%) would like to own one in their home country. Employment and job creation remain the hottest issues in the Middle East, including in the six countries of the Gulf Cooperation Council (GCC). Compensation Trends for Executive Search Professionals 2013. 2013 Telecommunications Retail Price Benchmarking Report for Arab Countries Report from the AREGNET Price Benchmarking Study April 2014 www.strategyanalytics.com Teligen, Strategy Analytics Ltd, 2014. Idea Factory on inclusive policies for young men and women in MENA Youth in the MENA region: How can the private sector create more and better jobs? 2011 Telecommunications Retail Prices Benchmarking Report for Arab Countries Prepared by Teligen on behalf of TRA Bahrain September 2011 www.strategyanalytics.com Teligen, Strategy Analytics Ltd, 2011. 10 TH HAWKAMAH ANNUAL CORPORATE GOVERNANCE CONFERENCE. Corporate Culture: The Secret Ingredient. 8 November 2016 Armani Hotel, Dubai, UAE.